Engraving of a view inside a zenana by William Skelton (1763-1848) after William Hodges (1744-1797). Plate 4 of William Hodges 'Travels in India, during the years 1780, 1781, 1782, & 1783' published in London in 1793. 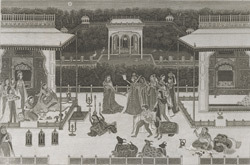 This engraving of a zenana, the women's quarter of a palace, was taken from an Indian painting in the possession of William Hodges. The scene takes place in garden courtyard. The principal lady of the court is sat in an elaborately decorated pavillion with attendants and watching court entertainments.